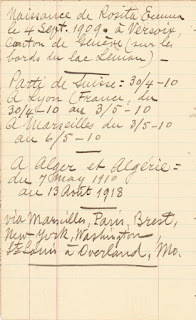 While I finished last week with the chronological journal entries Jean La Forêt had in his little notebook, there are other pages in the book. I thought I had three pages of birthdays, but the third page surprised me when I read through it. The first two pages are almost entirely names and dates, so I am not making a separate section for the one phrase that required translation. The third page, however, has more French and does have a separate translated section below. 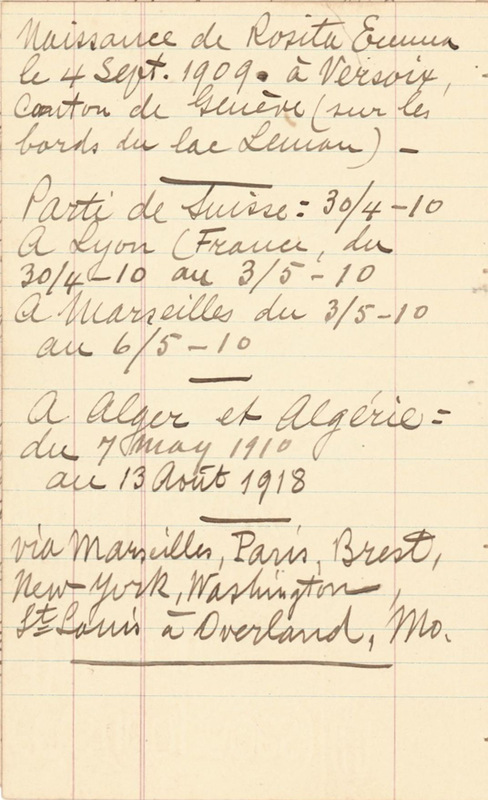 via Marseilles, Paris, Brest, New York, Washington, St. Louis à Overland, Mo. 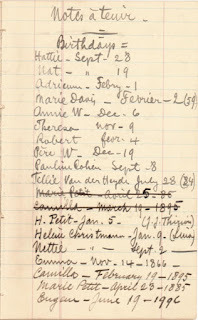 I wonder why Jean wrote several of the names and birthdays twice. Sometimes he didn't include the last name, sometimes he did. I'm sure his method made sense to him. A lot of names here are totally new to me. Who are the Christmanns? And the Witzes? 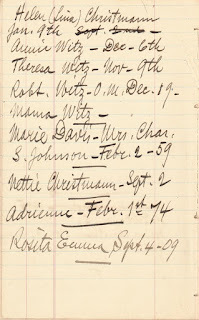 I don't recognize the name Marie Davis or Charles S. Johnson. I have no idea who Nat, Pauline Cohen, J. J. Thirion, and Tellie Van der Heyde are. We have seen the name Hattie before. Jean acknowledged that his survival from the assassination attempt in 1889 was in part due to Hattie. Was the woman whose birthday was September 28 that Hattie? Marie, Camilla, and Eugene Petit are Emma's children by her first husband, Emile Petit. 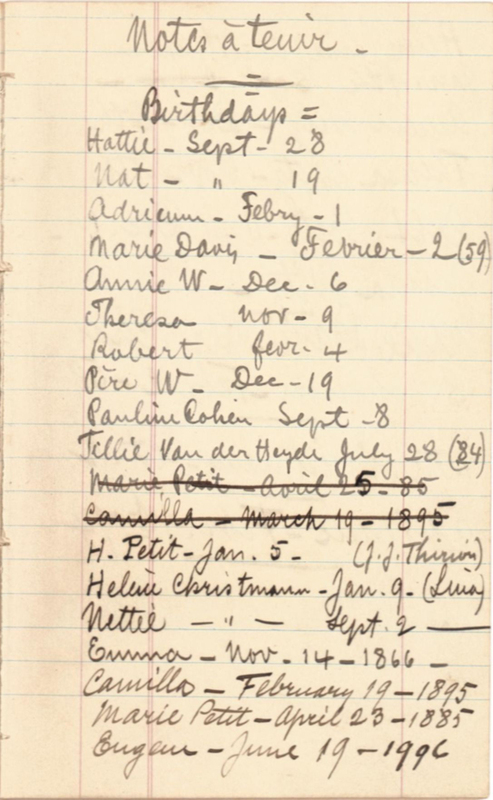 It's good that Jean was keeping track of his stepchildren's birthdays, even if he had two of them wrong the first time he wrote them down (but he was close). 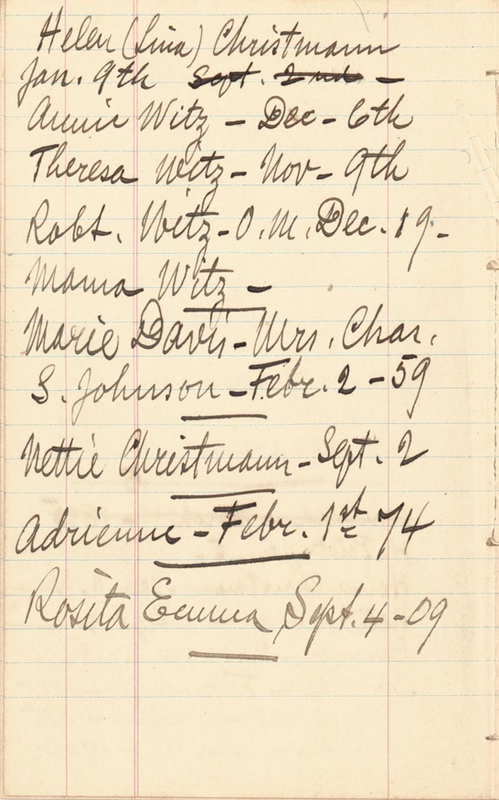 The dates for Camilla and Eugene are almost the same as those Emma gave when she registered as an American citizen in Switzerland — Jean wrote that Camilla was born in 1895, while Emma said 1894. I'm guessing Emma was probably correct. Obviously, Jean didn't really mean that Eugene was born in 1996. And now we have a birthday for Emma's oldest daughter, Marie. But H. Petit? Maybe that's one of Emile's parents? 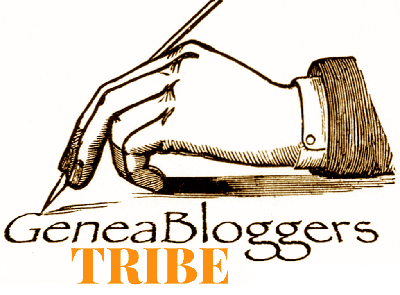 Camilla and Eugene, by the way, are almost definitely the children in the photo between Emma and Jean in yesterday's Wordless Wednesday post. The remaining name in these lists is Adrienne. I haven't written about her yet, but I know a little bit about her — I have a photograph of her from 1890. Her last name was . . . La Forêt. The writing on the photo looks more like Emma's than Jean's. If Adrienne was born in 1874, and Jean was born in 1853, there's a good chance she was his daughter. If that's the case, then who was Adrienne's mother? Neither Emma nor Jean has written anything about a previous marriage. According to Jean's first recommendation letter, in 1874 he was an instructor in Salonnes. I guess that's where I'll start looking for information about Adrienne. Then there's that third page. Funny how I joked last week that maybe Jean would add Rosita's birthday out of order, as he did his marriage to Emma, and then it shows up this way. And there's no question about the order of the pages: These pages are still attached to each other, and the notes about travel dates definitely come after the birthdays. But because Jean added these notes, we know he came back to the United States a little less than one year after Emma did and went to Missouri. And my geography lesson for the day is that Lake Geneva is called lac Léman in French.